The Austin company wants to work with solar panel makers to integrate its microinverters into panels, an approach that is gaining a wider acceptance in the residential market. How can you get the most performance out of a solar energy system? Microinverters could help. That's the pitch from SolarBridge Technologies, an Austin, Texas startup. The company aims to raise $10 million to $15 million and start manufacturing its first commercial product in the fourth quarter of this year, its CEO Ron Van Dell told Greentech Media. The company licensed the technology from the University of Illinois at Urbana-Champaign and validated it in an alpha version of its product last year, said Van Dell, who joined SolarBridge last November. He was the CEO of Primarion, a power management chip developer, before it was sold to Infineon Technologies in April last year. Inverters play a central role in the workings of a solar energy system. They convert the direct current produced by the solar panels into alternating current for their owners' use or for feeding the grid. Using a centralized inverter for each system has been the typical setup. But a growing number of solar companies are offering microinverters that are attached to each panel or a small rack of panels, an approach that is better suited for residential and small commercial installations where they are more likely be placed close to trees and next to other buildings, advocates say. 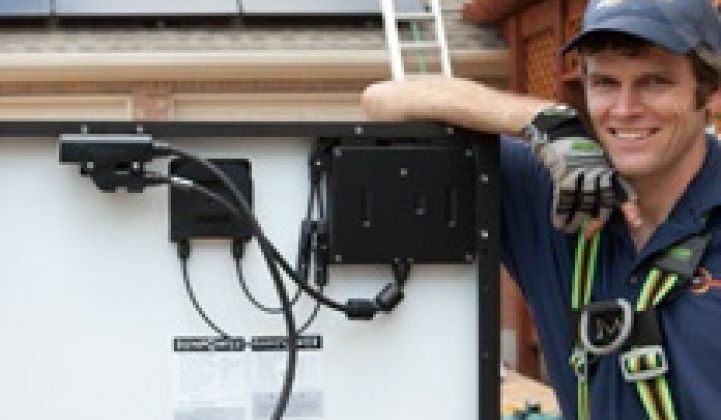 Atherton, Calif.-based Armageddon Energy, for instance, has devised a modular solar panel and rack system powered on microinverters. Assembling the rack and inserting the inverter takes only a few minutes. Any poor performing panels, the result of debris, shading or whatnot, could significantly lower the overall performance of the system, Van Dell said. A system's output could be cut between 5 percent to even 25 percent, the company said. Microinverter developers also claim to be able to more effectively harvest power from each panel, thereby increasing the overall electricity generation of a system. "A small solar energy system can be easily compromised, and it's a problem worth solving," Van Dell said. SolarBridge, which changed its name from SmartSpark Energy Systems last week to better brand its product, has developed a microinverter using film capacitors. The technology is better than the use of electrolytic capacitors, which don't last as long, Van Dell said. The company sees another startup, Enphase Energy, as a competitor. Petaluma, Calif.-based Enphase began commercial production last June and closed a $15 million venture capital round soon after. The company also confirmed this week that it had raised another $22.5 million, a round led by Madrone Capital and included a new investor, Bay Partners. Enphase plans to use the new funds to expand manufacturing and develop new products, the company said. Van Dell pointed out that Enphase uses electrolytic capacitors and offers a 15-year warranty for its microinverters, compared to the 25-year warranty SolarBridge plans to offer for its product. Solar panels typically have a 25-year warranty, so it's crucial to be able to match that, Van Dell said. Asked about SolarBridge's claims, Enphase's co-founder and vice president of marketing said "It is very difficult to comment on a product that is not yet available." Belur pointed out that Enphase got a head start in commercial production and already has sold "tens of thousands" of microinverters. SolarBridge wants to work with panel makers to sell panels that come with built-in inverters. Van Dell said that approach would simplify the installation process and reduce costs when compared with installing inverters separately on the job site. He declined to disclose which panel makers he's wooing. The company plans to launch the product with a customer starting in the first quarter of 2010. Enphase has been selling its microinverters to distributors and installers. But it also has a deal with Akeena Solar in Los Gatos, Calif., to somehow integrate the microinverters into an especially designed system with built-in wiring and other components. Branded Andalay AC, Akeena said the design minimizes the need to assemble various components into a system at the job site. SolarBridge plans to contract with manufacturers to produce the microinverters, Van Dell said. The company raised $6 million from Battery Ventures for the first round of funding. SolarBridge was founded in 2004, and the power electronic technology it licensed from the university allowed it to develop different products, such as battery chargers. It then settled on developing power conversion devices for solar, Van Dell said.